Have you been in a situation when you replaced the camera batteries and forgot to change the camera clock to the current date and time or set the wrong date or time like when you wanted to take photos and videos in the new year and set it to the year before ? Happily taking the photos and when you go back and checked, all the dates and or time are wrong. Arrgh! Ive been there several times. CM Batch MMedia Date Changer is a batch tool which help fix your Photo's EXIF, Creation and Modification Dates. 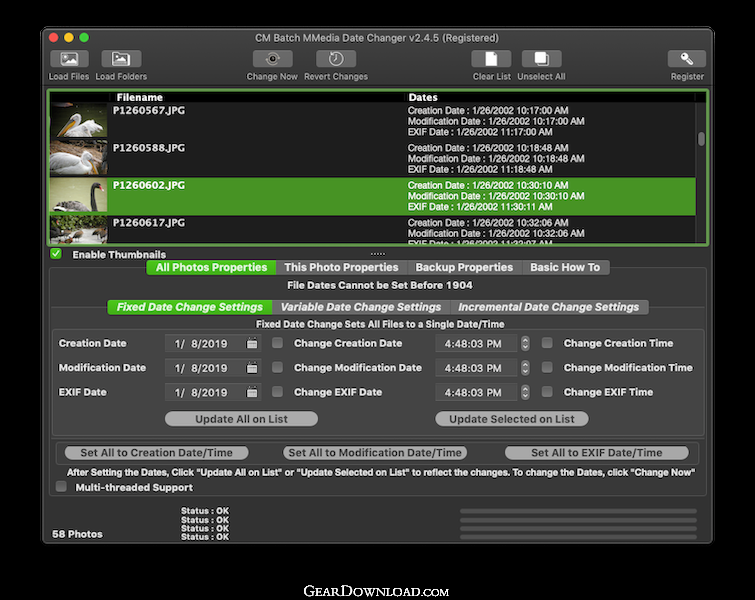 It supports RAW (Canon, Olympus, Sony, Nikon), JPG, PNG, MPG, MP4, M4V and MOV formats. You can change date by the Fixed Date option, variable and incremental date options. It supports working with one or more photos and videos at a go. Many date changing apps does not touch the EXIF dates which is much needed when it comes to cloud storage such as Google Photos. Fixed Date option let you change all to a single Date and/or Time. This is great if you just got the date wrong on the camera. Variable Date option offers a simple yet powerful date maths algorithm which lets you add or remove day, month, year, hour, minutes or second from the dates. Incremental Date Change lets you start from a single date and time and increment by your defined minutes or seconds interval. CM Batch MMedia Date Changer fixes a problem which we may face from time to time. This download (cmbatchmmediadatechanger.dmg) was tested thoroughly and was found 100% clean. Click "Report Spyware" link on the top if you found this software contains any form of malware, including but not limited to: spyware, viruses, trojans and backdoors.